Are rising utility bills threatening to sink your finances? Try a handful of these tips to lower your electric and water bills instead. I remodeled my house a few years ago, replacing old single-pane windows and beefing up the attic insulation. This cut my heating bill by almost 50%! That was so inspiring, I challenged myself to see how much money I could save by conserving energy elsewhere in the house. Here is what I’ve learned, either first-hand, through research or by talking to other frugal folks. Some of these things are more expensive than others are. You do want a high return on your investment (ROI), so crunch a few numbers to see how long it will take for your upgrades and purchases to pay off. I have listed them approximately from least to most expensive. Caulk around the trim on all windows and doors, inside and out. Spray foam insulation around your electrical outlets. Insulate your ceiling and sub-floor. Window coverings keep heat in during winter and out during summer. Replace single pane and older double pane windows with energy efficient, low-e windows. Unplug small appliances and electronics when not in use, or put them on a power-strip that you turn off. When your TV is “off,” it still uses energy, so the remote control will work. Replace incandescent bulbs with CFLs, which use 75% less energy and last 10 times as long. Now LEDs are getting less expensive, are more efficient, and have a longer life. When your old appliances need replacing, buy Energy Star appliances. Related: Are CFLs or LEDs the Better Lightbulb Choice? Turn down your thermostat in winter and up in summer. If you are chilly, put on a sweater! Ceiling fans distribute heat in winter and remove it in summer. They also pull in cool night air in summer. Install a programmable thermostat. You can set it to heat the house only when necessary, and you won’t have to remember to turn the thermostat up or down every day. Have your systems checked once a year, and replace the AC and furnace filters as recommended for best performance. Plant shade trees on the hot side of your home. This is southwest and west, but will be determined by the orientation of the building. If you are heating with passive solar, don’t plant trees due south. Even the shade from the bare limbs cuts the efficiency of the sun. Install windows on the south side, or the sunniest side, of your house, and let the sun heat it for free! Turn down the thermostat on your hot water heater. Put an insulating blanket on your hot water heater to keep the heat from escaping. Keep water in the refrigerator instead of running the tap until it’s cold. Hang your clothes on a clothesline or drying racks. Catch rainwater for irrigation or domestic use. For the garden, you can use simple five-gallon buckets recycled from a contractor or donut and ice cream shops. For domestic use, you can install a catchment system with gutters and barrels or a cistern. This water needs to be filtered and tested regularly. Use low-flow showerheads and faucets. Replace old toilets with low-flush or dual flush. Most toilets are water savers these days, and they aren’t expensive. Install an on-demand (tankless) water heater. Water is heated only as you use it, running through a series of tubes that get heated by your fuel source. There is no 40-gallon tank to heat all day while no one uses it. Buy a front-loading washing machine. These use 1/3 the water of a top-loader, saving water and fuel. They usually pay for themselves in a couple of years. Install drip irrigation. Water will go directly to the base of the plant instead of all over the yard as with a sprinkler. Landscape with native plants and grasses. Native plants are accustomed to your climate, so they will survive on the available water. They also need less fertilizer and maintenance, saving you even more money. Install solar hot water. This drastically cut my gas bill, and my system will pay for itself in six years. Don’t try all of these things at once. You may get overwhelmed! Take on one or two at a time, starting with the least expensive. Sometimes the simplest solutions are enough. If you can do them yourself, you can save the cost of a contractor or handyman on top of the money you will save on your utility bills. Don't stop with the utility bills. Make a plan to lower your debt as well. 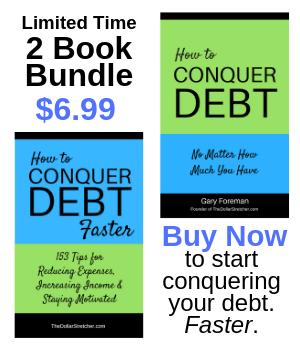 Get How to Conquer Your Debt No Matter How Much You Have.